Egypt has accused Palestinian Islamist group Hamas of involvement in the killing of Egypt's public prosecutor. Hisham Barakat died in hospital after a bomb attack on his car in the Cairo suburb of Heliopolis in June 2015. The plot was "carried out on the orders of the Muslim Brotherhood in close coordination with Hamas", Egypt's interior minister said on Sunday. Mr Barakat had sent thousands of Islamists for trial since the overthrow of President Mohammed Morsi in 2013. Hamas has accused Egypt of collaborating with Israel to try to further isolate Gaza amid tension over Egypt's closures of the Rafah border crossing and its destruction of tunnels between Gaza and Egypt. Image caption One of Mr Barakat's bodyguards said that the 2015 explosion had felt like an "earthquake"
"This plot was carried out on the orders of the Muslim Brotherhood... in close coordination with Hamas, which played a very important role in the assassination of the chief prosecutor from start to finish," Interior Minister Magdy Abdel Ghaffar told reporters. He said Hamas had provided explosives and training in Gaza. On Saturday six people were arrested on suspicion of involvement in the assassination. Mr Barakat was the most senior state official murdered since the 2013 overthrow of President Mohammed Morsi of the Muslim Brotherhood. Hundreds of Islamists have been sentenced to death or life imprisonment, as part of a crackdown on supporters of the banned group. 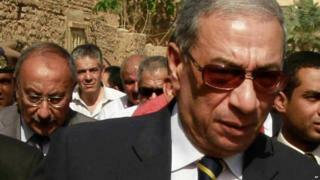 Image caption Interior Minister Magdy Abdel Ghaffar described Mr Barakat's murder as a "very big conspiracy"